It’s been a long time coming, but the backyard is finally finished. It’s not a big space, but I think we’ve managed to do a lot with it. And by “we” I mean my landscaper and his cousin. 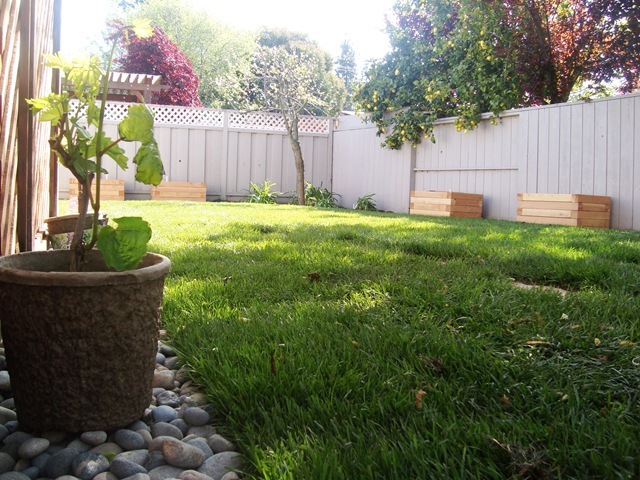 I am more than happy to give referrals to anyone on the San Francisco Peninsula who needs a good landscaper. Overgrown with weeds, a bush that served no purpose beyond catching lemons that fall from the neighbour’s tree, and a wildly growing peach tree perfect for poking at children’s eyes. An air conditioner unit just sitting there against the back wall, and a garden shed full of old paint and tile (and spiders) taking up a huge portion of what was left of the patio space after we expanded the house. So…there was some stuff to do. A step to the back yard. What a concept! You mean I don’t have to leap off out of the back door anymore? Weeds pulled, irrigation in place for what will hopefully be something requiring irrigation instead of weeds, which somehow do not require irrigation. A covering for the air conditioner, which also covers that window in the back so the peeping Tom’s can no longer get an eyeful when I forget that it’s there. The lawn is in, and the cement step was finished with flagstone. Stone-filled planters border the house and the lattice-work. Two-feet tall wooden planter boxes line the fence. Grapevines (now in the ground, not sitting on top of the rocks) are in front of the lattice work, and will grow up to provide more covering, and also, hopefully, fresh backyard grapes someday.) The peach tree in the distance is trimmed to adult-eye level, and one of the old plants has been divided up to dot the area around it. The apricot tree provides shade. 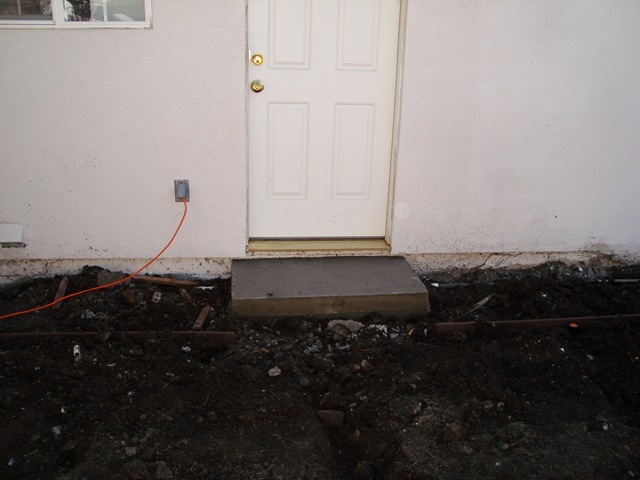 Two flagstone pathways arc out from the rear step, one to the patio, one to the side of the house, helping create a full circuit walkway around the entire house when the gates are opened. 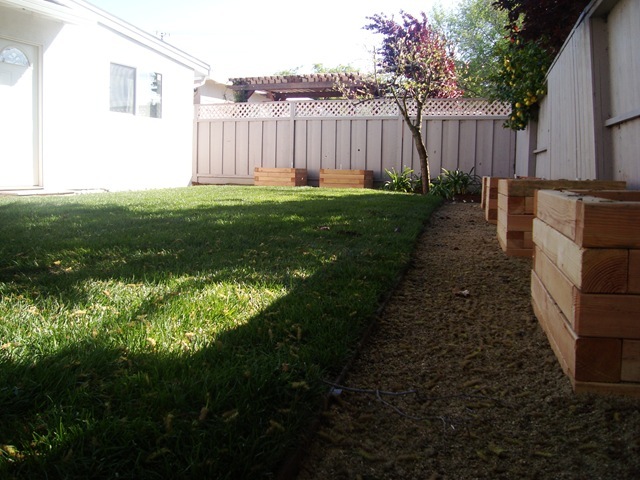 The wooden planters sit on stabilized sand surface, away from the grass and its sprinkler heads. Each box has a its own sprinkler heads, and will soon see tomatoes, cucumbers, peppers, lettuce, and herbs trying to survive under my neglect. The shed is gone, and in its place will go a table, chairs, and the grill I’ve been using back there for the past few days. 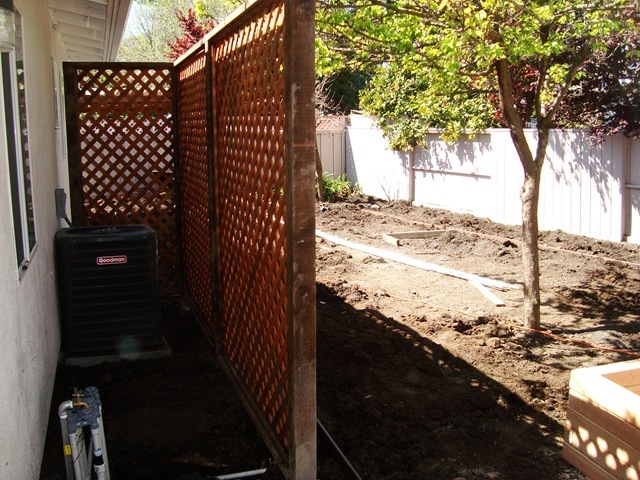 We enclosed the open end of the lattice with a gate that will give us, but not the kids, access to the hose, irrigation, and air conditioner. All of that, and there’s still enough room for a slip ‘n’ slide back there. Seriously, if you want a landscaper, I know a guy. Beautifully done. For once, I have no urge to snark. Your designer created an excellent combination of design and function…lovely. Yeah. I made a bad choice with the filler stones for the house-adjacent planters though. I picked river stones, since they looked the best, but I realize in retrospect that they're just weapons for kids. I may have a broken window in my future. Someone asked me if I was going to do Zero-scaping and I was all "No, I'm already doing that. Now I want a yard." Would love to do that, but holly cow batman is that expensive. Looks amazing. Now don't go messing anything up by getting a dog who will poop all over the place. It's possible I'm speaking from experience there. I don't even let the kids walk on it. Looks great. 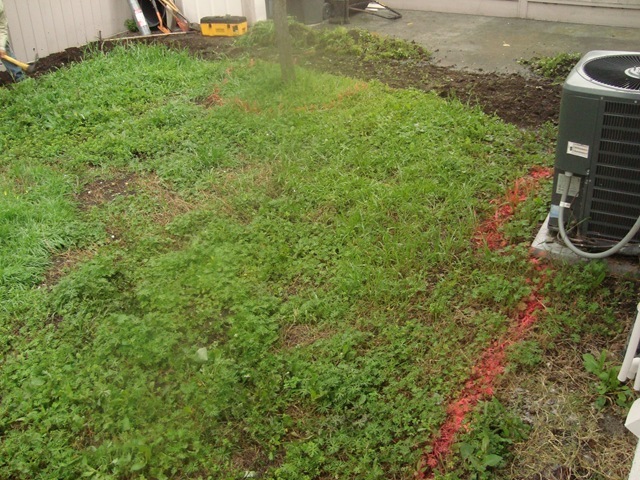 We need to start working on your yard…if it ever stops raining. The rain delayed us about a week in the middle. Great job on the yard. Looks like you're ready to add a playset. I like it! Those wooden planters make you look like a bee keeper, though. Those top two pictures look just like our yard, except our yard is a billion times bigger. I have all these dreams of what our yard could be, but those dreams take many monies. Of which I have none. My 8 year old loves clover and thinks we should just have our whole yard be that. She may be on to something. That's a nice looking backyard. 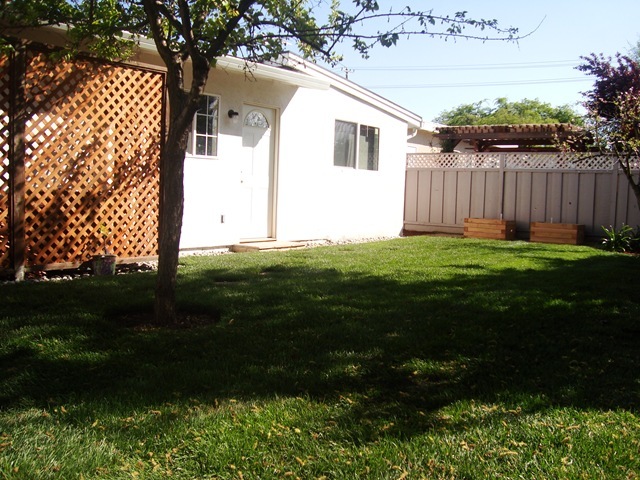 Got a nice shade tree, and the grass just begs to be rolled around on wrestling with kids. Nice! 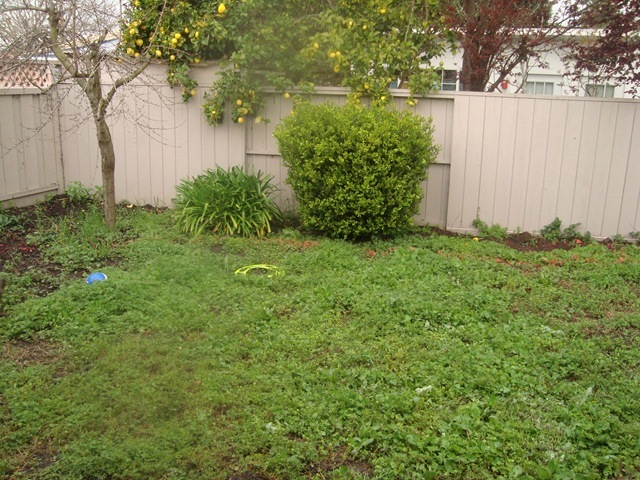 Wish I could find away to keep the dog from destroying our back yard so that when our little one arrives he'd have a place to play, but I think by the time he's that age we might have moved to another house…and hopefully with a bigger back yard!! Nice! 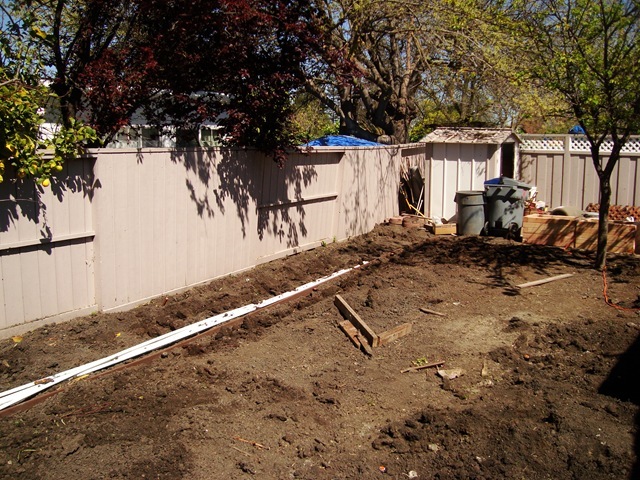 Wish I could find away to keep the dog from destroying our back yard so that when our little one arrives he’d have a place to play, but I think by the time he’s that age we might have moved to another house…and hopefully with a bigger back yard!! Previous Previous post: It’s Quiet. Too Quiet. Next Next post: Backpacking Dad’s Overdue Reviews: Is there anything manly about the bird of peace?